Hardie Karges has one self-professed goal in life: to see every country in the world. And he’s off to a grand start! His recently self-published book, Hypertravel -100 Countries in Two Years is less about Karges’ journey to most of the countries defined by the United Nations as countries, and more of a journey into Karges’ mind. That’s not to say we don’t get some powerful and startling insights into the countries, villages, bus depots, airports, marketplaces, cafes, cities and dumps he wanders through. We do. But don’t for one minute underestimate him. His humor and tongue-in-cheek approach belies astute observations about the countries of the world, their people, cultures and traditions. His hopscotching the globe could not have been accomplished with heavy reliance on the Internet, and his desperate search for WiFi spots is one of the humorous high points of the book. But so is his exhausting mastery of bus and train schedules, the art of ticketing convoluted flights that often take him back to a destination, in order to go forward, just so he could go further back from where he started. This travel legerdemain requires fortitude, street-smarts, planning and tremendous sense of curiosity coupled with life-saving humor and patience. But I especially love Karges’ sense of irreverence. Take the Italian island of Rimini, for example, the celebrated seaside resort along Italy’s Adriatic coast. For most travelers, it’s a place for the rich and famously tanned beautiful bodies. But between seemingly endless searches for visas, hotels with Wi Fi, cheap buses and random airlines to take him to even more random places like Somaliland (is that even a country? ), the author shares a running commentary on everything from religious overtones of Islamic or Christian enclaves, to the street touts who try to scheme him. 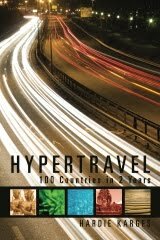 Hypertravel is a guide book of sorts, but not the kind one reads for bus schedules and generic places like “the Middle East.” Karges unravels the places he visits, and if he doesn’t go very deeply, he more often than not strikes a true chord with an honest, clear-eyed look at who he is and who the people he meets are. There is one serious omission in his book, and one I was surprised to discover: The total lack of illustrations and maps. It’s inconceivable that a travel book such as his would not have visual summaries and examples of his journey. The reader, I’m sure, will grab his or her atlas and try to follow his routes. He could have made his book more appealing and interesting if he had supplied some of these reference points for us. Karges may or may not be a modern day Ibn Batuta or Marco Polo, but he wrote a fun and informative travel journal that really should be read. To see what this intrepid traveler looks like (and who his friends are), check out his Facebook page.